In this tutorial you will learn how to add some simple makeup with photoshop which can be a great way to enhance a portrait photograph. Start Photoshop with the photograph that you want to add make up to open. First we are going to add a lipstick effect. 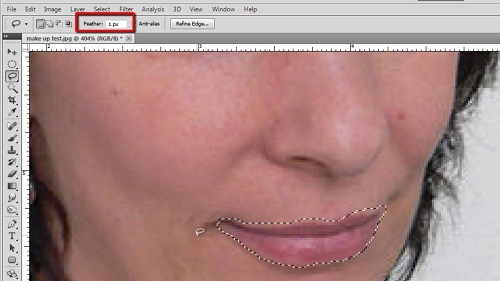 Zoom in on the lips and from the tools on the left select the lasso tool, in the options at the top set a “Feather” of “1 px”. 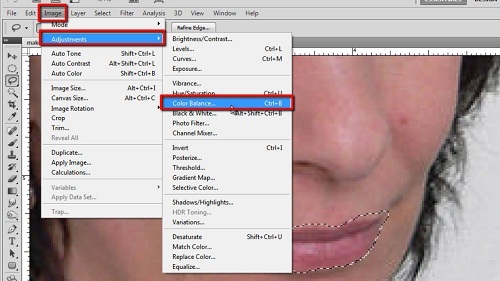 Now, use the tool to draw a selection around the lips. Now, click the “Image” option in the main menu, navigate to “Adjustments” and click “Color Balance”. On the top slider click the pivot and more it towards the “Red” side of the spectrum. You will see the lips start to change color on the main image and when you achieve a color you want click “OK”. Here it looks about right with a color setting of “+59”. Press “Control” and “D” on the keyboard to remove the selection and zoom out to see the result. 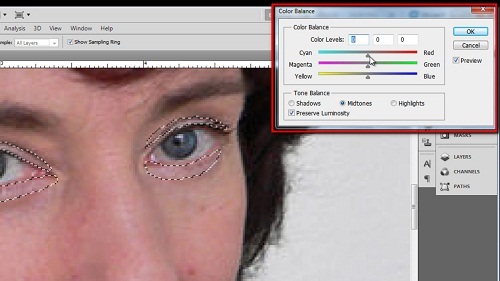 Now zoom in on the eyes and use the lasso tool to select an area around them. The area you select will largely depend on how much make up you want to apply. Here we are just drawing a relatively small area around the eyes. Once you have made your selection, enter a feather radius of around “5 px”. Now click “Image”, “Adjustments” then “Color Balance”. This part will require some experimentation as you will want to find a color you like. Here we are going for a purple. Click “OK” when you have a good result, press “Control” and “D” again to remove the selection and then zoom out to see the result. That is the simple process for learning how to do makeup with photoshop.